What season would be complete without sugar cookies... okay, several versions of sugar cookies. You might remember my Heirloom Pumpkin cookies I made a couple of weeks ago to match the fun colors of the heirloom pumpkins I'd found. 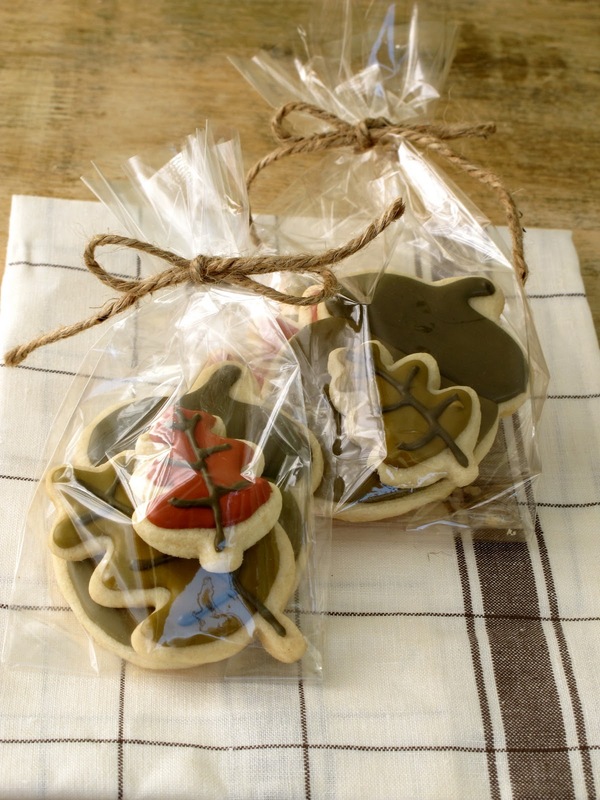 These Fall Sugar Cookies are a mixture of different colors and sizes of leaves and acorns. To make the different shades of warm reds, golds and browns, I started with a light brown icing, then added red (for example) to achieve a muted "Fall" red color. I used the same technique for the gold and darker brown icings. For more details on how I mix icing colors, visit this post! I featured these Fall Sugar Cookies at my Front Porch Pumpkin Carving Party. These cookies would be great for the rest of October and November - You could even have them out for Thanksgiving! I made your sugar cookies before, and they tasted great...however, i found they expanded quite a bit and lost their shape. Would you recommend refrigerating them before baking to hold the shape better?